Both the Isle of Man and the Channel Islands, though part of the United Kingdom, stand separate from England, both geographically and in other ways. That means looking at some of the same resources used for British family history, but also others, some of which are available online, and others which aren’t. That could well involve trips to the places to investigate. 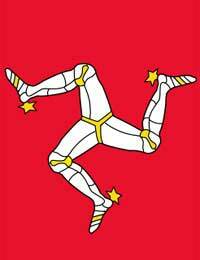 The Isle of Man is an ancient kingdom with stronger ties to Ulster, Scotland, and even its Viking past than it really has to England, although administratively it’s definitely part of the UK. All census records are kept in the British National Archives in London (available online), and make a good starting point. Whilst civil registration of marriages, births and deaths started in England in 1837, they didn’t begin so quickly on the Isle of Man, where it was 1849 for marriages, and not until 1878 for births and deaths. Records are kept on the island, and available at register offices in the four main towns, Douglas, Ramsey, Peel, and Castletown. This means, of course, that any researcher will rely more heavily on parish registers, many of which have been collected by the Society of Genealogists. However, a number of those can also be found in the International Genealogical Index maintained by the Church of Latter Day Saints, and available online. Manx National Heritage is also a very useful resource for anyone trying to ease their way into Manx family history, and has publications available. Lists of householders for different places and times exist (one of the oldest is for Douglas in 1730), which can be very informative. It is also possible to find extracted probate records for at least some wills online. In all records have been kept of wills and probate back to 1620. It’s also worth learning about the surnames common on the island and their history if you’re going to dig into family history there at all. The Channel Islands offer a different challenge. Situated closer to France than England, the daily language is a mix of French and English, although English is the official language. Jersey is the main island, but Alderney, Sark, and Guernsey are also important, and control some of their own administration, just to complicate things further. For census purposes, the Channel Islands are included with England and Wales, meaning that all records are kept at the National Archives and are available online. Additionally, much information for all the islands can be found, as with the Isle of Man, at the International Genealogical Index. For Jersey, there’s a good family history section at the Société Jersiaise in Lord Coutanche Library at St. Helier. The Jersey Archive, also in St. Helier, has censuses, registrations of births, marriages, and deaths, as well as wills and probate records from 1660, and church registers, in both the original and transcriptions. Beyond Jersey, records aren’t so centralised. On Guernsey, for instance, parish records are kept in the parish churches, although the Society of Genealogists has copies. After civil registration began in 1842, records were kept – as they still are – at the Royal Court House, which also houses property transaction records from 1576 onwards. Records on Alderney are spotty, but the island has a family history volunteer who keeps copies of all records. Sark actually comes under the bailiwick of Guernsey, and all its records are kept on that island.